Ahn Ha Yura Hello, I’m Ahn Ha Yura who was selected to be a trainee of The Sookmyung Times. I’m excited and nervous to be part of SMT. It was one of my dreams since high school to work for news media. I will work hard to comprehensively deal with various social issues by writing articles in SMT. Choi Cho Huiryung Hello! I’m Choi Huiryung, 87th cub reporter of SMT. I’m really pleasure to join SMT as an academic journalist at Sookmyung. My career dream is to be a real reporter and make the world better, so I promise to present the news to you fairly and without bias, but also with a warm-heart. Thank you. Jung Kim Hyeseung Hello Sookmyungians! It’s such a pleasure to introduce myself here as an academic journalist at SMT. I will walk beside you, share life with you, and empathize with you. I am ready to listen to your stories and share them with Sookmyung. One of my favorite parts of the poem "To Lady" is “I’m starting to sail because the pathless sea is my world!” These words truly express my character. Please keep an eye out! Kim Han Yujin I’m so glad to be working as a reporter in The Sookmyung Times. I promise to be the voice representing all Sookmyungians and always be sensitive to your needs. Also, I promise to be truthful in my articles and write sincere and accurate articles. Kim Lee HyunMin Hello, Sookmyungians! It’s an honor to greet you as a member of The Sookmyung Times. As much as I have a lot of affections here, I promise to write articles that will spark your interest and keep you wanting to read more. Most of all, I will try to be type of reporter who not just hears but listens to the voices of Sookmyungians. Thank you. Kwak Lee Shinyoung Hello, everyone. I’m Lee Shinyoung, who is a 87th cub reporter of The Sookmyung Times. It is really a great honor to be joining The Sookmyung Times. I hope to broaden both yours and my perspective through various experiences at SMT. My university life begins with SMT. Lee Hwang Hayoung First of all, I’m grateful for being able to work as a member of SMT. 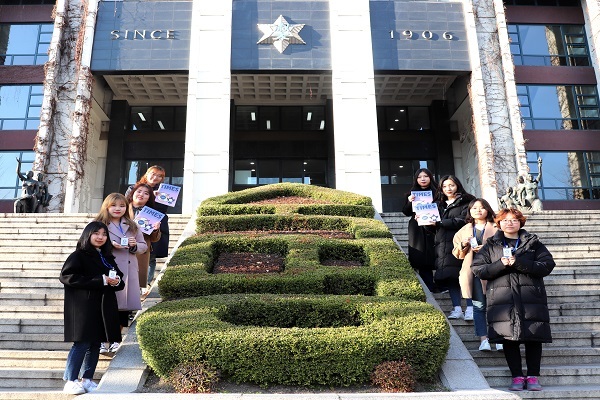 I’ll try to expand my knowledge and be a better academic journalist who writes meaningful articles for the students at Sookmyung Women’s University. Thank you again for reading my introduction, and I promise to do my best.